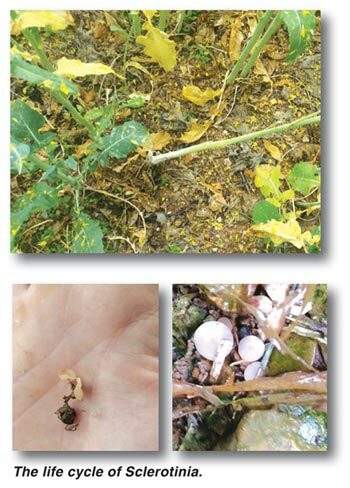 Sclerotinia stem rot (Sclerotinia sclerotiorum) is one of the world’s biggest threats when it comes to canola production and the obtainment of high yields. 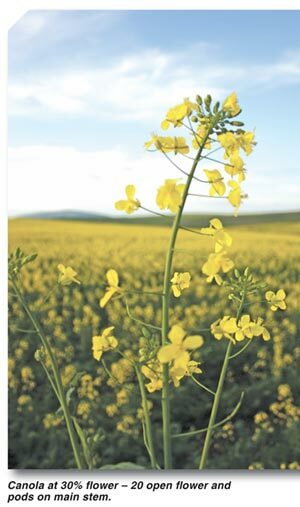 Up until 2013 the effect of the disease on the South African canola industry was regarded as negligible small. Since 2014 however, the management of the disease has become more difficult and the failure of doing so resulted in below average yields. The symptoms are a greyish, bleached lesion on the stem of the canola plant. A white fungal growth will, under the ideal conditions, cover the lesion. It is usually found on the lower part of the main stem, but it can occur on the whole plant. Where the infection occurs, the plant will usually lodge and wilt which will result in early maturing. This early maturing (dying-off of plants) will cause seed loss and yield reductions. Advanced infection can be observed as black irregular shaped round bodies in the stem. The sclerotia (round shaped bodies) are the survival structure of the fungus. 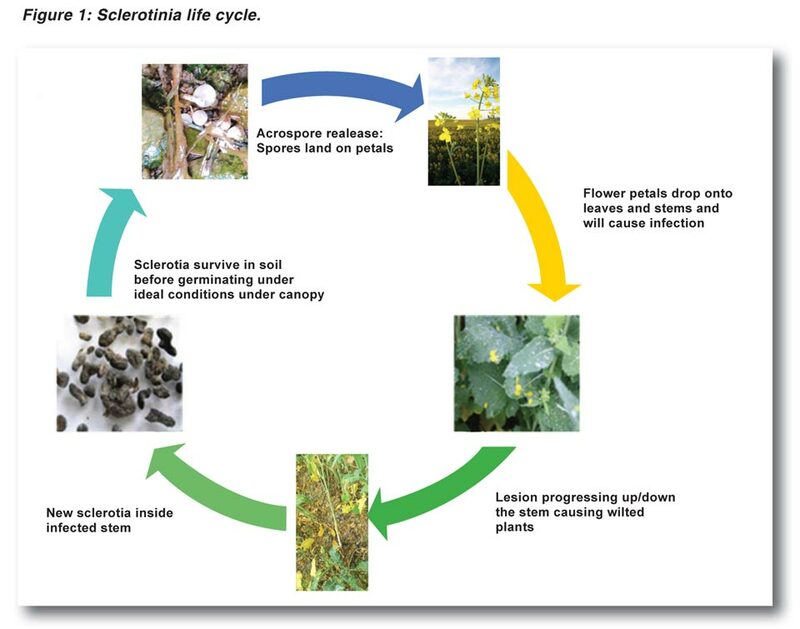 The life cycle of sclerotinia can be seen in Figure 1. Temperatures between 11°C to 14°C for a period of up to ten days during early flower. Canola or lupins on the field in recent history (sclerotia can survive up to six years in the soil). Disease incidence in the last affected crop. Distance from the last affected crop. Rain and wet conditions during flowering. During the last couple of years extensive testing of different fungicides have been conducted and the results were promising in most of the trials. Currently two products are registered for use against sclerotinia on canola, namely, Amistar and Prosaro. The timing of application is the most crucial part of your application since the window for the correct stage is very small. The objective of the fungicide application is to cover as many petals as possible while ensuring that the chemical also penetrates into the canopy to help protect potential infection sites (such as leaf axils and bases). The chemical is only active on petals present at the time of spraying. The chemical will not protect petals that emerge after spraying, but some chemical coverage within the canopy may help to restrict infection. The fungicides cannot cure infections that have already penetrated into plant stems, hence the need to apply the fungicide prior to significant petal drop when conditions are conducive to sclerotinia infection. It is important to spray the fungicide on as much of the yellow petals before petal drop occurs, which is usually at 20% to 50% flowering. Table 1 can be used as a guide to determine the optimum timing of fungicide application. The timing of the fungicide application is the most important factor to consider when you decide to spray against the disease (based on the factors mentioned earlier). Monitor your crop thoroughly and continuously for correct timing. It is important to remember that different cultivars have different growth periods as well as different flower rates. Be sure to scout all your fields before spraying for the ideal timing for that particular field. 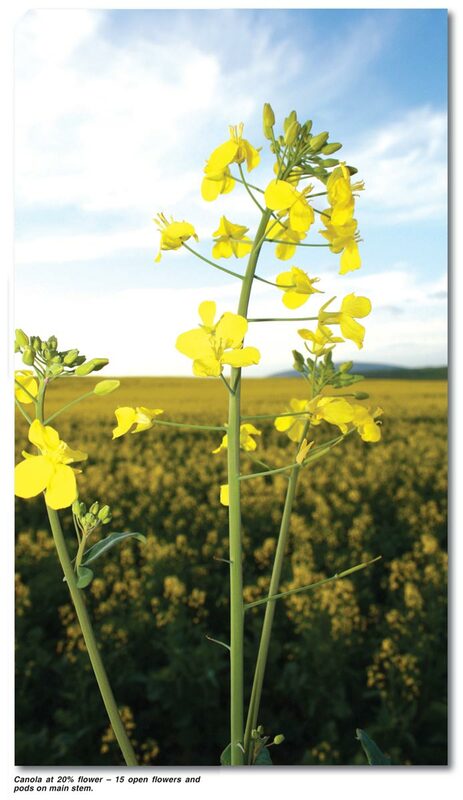 When following a pro-active integrated management system involving crop rotation, cultivar selection, fertilisation programme and fungicides, sclerotinia stem rot should not be a problem in your canola crop. Article submitted by Franco le Roux, Agricultural Resource Manager: SOILL. For more information, send an email to franco@soill.co.za.